You are here: Home / Tips for Pilates Studios / What Can Promotions do for Your Fitness Studio? What Can Promotions do for Your Fitness Studio? I was cleaning out my closet recently, and I figured out that I have a whole bunch of Tee-Shirts that I don’t ever wear. I don’t like the crew neck line — and when I got to exercise — I’m usually wearing a top that isn’t so thick! However, that doesn’t stop me from any sign that says “spin the wheel to win a t-shirt” when I’m in an exhibit hall, and it seems to hold true for fitness studios for me as well. If the option is there to attend a certain number of classes and win a tee-shirt — my competitive nature takes over, and I have to get that number of classes — even if I’m not thrilled with the tee-shirt design. Does this translate to others? It seems to. When I worked at the VA we took an exhibit booth to many big health care conferences / exhibit halls, and everyone who worked in the booth generally came home with another suitcase of swag from the exhibit hall including 10-15 tee-shirts. Really — does anyone need that many tee-shirts? I’ve created promotions for a couple of studios that I work with — and we’ve found that people really engage in promotions where the current status is posted in the studio. Whether it’s attend 12 classes this month, or attend 30 classes over the summer — as long as we have a tracker sheet posted in the studio, students engage. 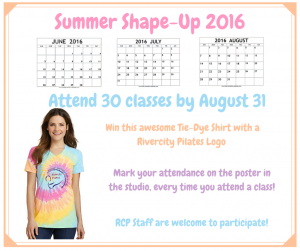 Here’s the Summer Shape Up promo that we did at Rivercity Pilates. Here’s a statement from Carey, the owner of Rivercity Pilates, about the cost of the promotion and the tee-shirt. Farm Girl Promotions are less than $100 per custom promotion, and I’ll do the graphics and the social media posts for you to promote it. If you’d like to talk about Farm Girl Promotions for your business, make an appointment for a free consultation today! Previous Post: « Do you “engage” your social media audience?